In this series I will be taking you step by step through the process of reproducing famous paintings in miniature, starting with Vincent Van Gogh's Sunflowers. In 1880, aged 27, following a series of failed career choices, failed love affairs and a severe bout of depression, Vincent van Gogh (1853-1890) made the decision to become an artist. He briefly joined the Academy of Fine Art in Brussels but formal training didn't work out for him and, supported by his brother Theo's patronage, he instead learnt from his peers in Brussels, Paris, and finally in Arles in Provence. Theo's support lasted for Vincent's entire life - famously, he only sold one painting during his lifetime - and it is from the letters between the two brothers that we know so much about his life. 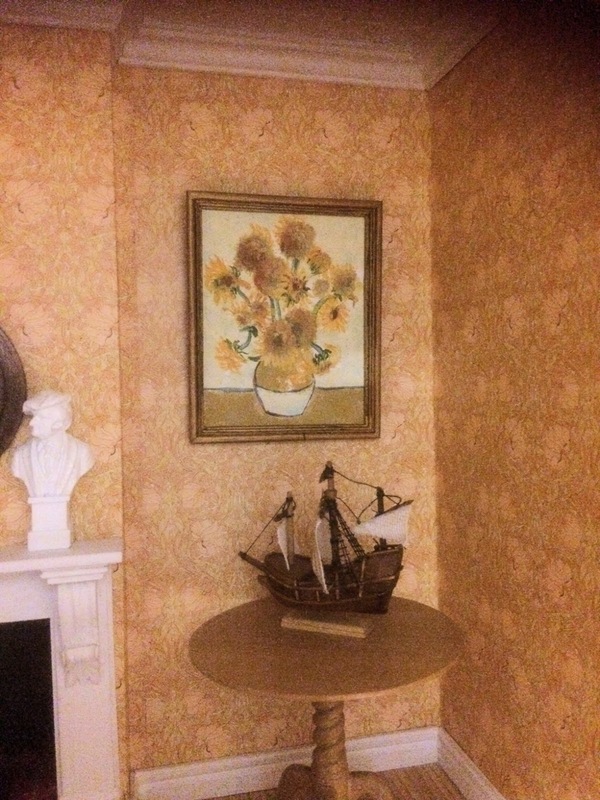 Vincent's style is classed as Post-Impressionism. He was heavily influenced by the artistic community around him, taking on board pointillism, impressionism and tonal theory and developing them in his own unique style. One of his ambitions was to form an artist's community in the South of France where all members could continue to learn and develop together. Let's set the scene. The year is 1888, we're in Arles, Provence, in the South of France. We've found a lovely house where we can set up our artist's colony, and we're so desperately looking forward to fellow painter Paul Gauguin's imminent arrival. We're in the throes of our yellow phase; we're planning to cover our walls in 12 panels of bright yellow sunflowers - this one is number 4 in the series. Our vase of sunflowers is starting to die and we must work quickly! Vincent van Gogh worked his paintings on canvas. To recreate Sunflowers in miniature we need a support that will give the impression of a miniature canvas but without the weave of the canvas dominating the finished painting. I recommend using off-cuts of smooth mount board, easily obtained from a framing shop - if you ask nicely the proprietor will probably give you his off-cuts for free. Van Gogh's painting measures 73 x 92.1cm. To find how big yours needs to be simply divide these measurements by the scale you're working in. On a 1:12th scale, dividing by 12 will give us 6 x 7.8cm, 1:16th it will be 4.5 x 5.75cm, and 1:24th it will be 3 x 3.8cm. I'm working at a 1:16th scale. Van Gogh made rustic timbre frames for his paintings, however after his death when his paintings became valuable, art dealers upgraded these frames to more ornate ones. I have chosen a vintage brass frame to work with. If you are planning to use a pre-made frame with your finished painting, using your steel rule and craft knife, cut out the mount board to the correct size. Insert your mount board into your frame and draw around the aperture so that you know how big your painting needs to be. Remove the mount board from the frame and apply 2 coats of gesso with a flat brush to prepare your canvas. This will stop your paints from soaking straight into the board. You'll need to leave it for at least a day to thoroughly dry. Nothing is perfect in this world and my frame is not exactly the same proportions as the Sunflowers painting, it's taller than it should be, so I have drawn another line at the bottom of my canvas to show where the actual painting will start. I'm going to extend the background and the table to fill in to my frame edges. There are several ways to draw your sunflowers accurately. My favourite method is to make a dot to dot by measuring key points. Open my drawing in a separate window and scale it (by making the window smaller) so that it is the same size as your piece of mountboard. Then start at the bottom left hand corner and measure up the sides to the table edge. Measure to the same position on your canvas and place a dot. Repeat with the other side of the table and the main points of the vase, and then you can begin to join the dots. Continue to add dots, joining as you go and checking that you drawing looks right until you have a complete drawing. If you are working in a different scale to me, simply multiply the measurements you take from my drawing by your scaling factor. For example if you want your painting to be 1:12th rather than 1:16th, multiply your measurements by 16 and then divide by 12. If you want to be working in 1:24th, multiply each measurement by 16 and divide by 24. Please don't worry if your sunflowers are slightly different to mine, van Gogh painted so many versions of his sunflowers that it really doesn't matter! Next, cut out a piece of acetate (a greetings card wrapper will do) and using a waterproof marker pen, trace your drawing onto the acetate. This is extremely useful if you find that you lose your lines at any stage during the painting process - you can simply hold your acetate over your painting and see where you have gone off track. Before we add some colour we're going to need a palette. To make my own own stay-wet palette I use a small plastic takeaway box lined with wet kitchen roll on the bottom and greaseproof paper on top. When I leave my paints for any length of time I simply put the lid on and the paints stay workable. We're going to begin by roughly mixing a tiny amount of arylamide yellow light with a one-centimetre-splodge of titanium white to give a very pale lemony yellow. In a separate area mix a tiny amount of French ultramarine with a centimetre dollop of titanium white to give a very pale blue. Using the small round stippling brush, dab the pale yellow and pale blue randomly around the background of your flowers. Hold the brush almost vertically and don't use too much paint, blurring your strokes to achieve a soft background. Use the same mix of colours and the same technique to paint the bottom half of the vase, with more of the pale blue at the bottom of the vase to give the impression of shadow and form. Now mix two different strengths of arylamide yellow light, yellow ochre and a touch of burnt umber, one with slightly more arylamide yellow light and one with slightly more yellow ochre. Using your stippling brush at an angle of 45 degrees, dab these two colours randomly onto the table. You're looking for a nice soft finish with more texture than the background but without any blobs of paint standing proud of the surface. This same mix now needs to be applied to the top half of the vase. Using the mix that you used on the table, generously stipple all over the round seed heads using your brush held vertically with a light bouncing motion. Stipple in some extra arylamide yellow light and a little of the pale blue that we used in the background to tinge some areas with a slight green tint. We're looking for lots of texture here so use your brush vertically and try to get some raised bumps in the surface. Next we're going to paint the centre flower. Squeeze out a tiny amount of burnt sienna into your palette and using your small round brush, and gently paint the circle with a round and round motion. Stroke in some burnt sienna centres to the other flowers that will have petals. To do the green centres we need to roughly mix some arylamide yellow light and french ultramarine in differing amounts in your palette, to achieve two or three shades of green from light to dark. Apply these to the centre of the seed heads then put the lid on your palette and allow the whole painting to dry. Is it touch dry? Then let's carry on and add in the green leaves and stems. Check the paint in your paint in your palette - if it hasn't formed a film then it will still be workable. Using the same two or three shades of green that we mixed in step 8, paint in the green leaves and stems using your small round brush and working in the direction of growth. Try to vary the shades so that each leaf and stem has lights and darks, this gives interest and depth to your painting. I've noticed that on my painting I can still see pencil marks around my flowers so I'm going back in with more of the colours used in step 7, emphasising the lights and darks. Van Gogh was a master of tonal paintings, using similar colours mixed in slightly different ways to add depth and definition. Paint some background colour in over the remaining flower to be painted, keeping in your mind the position of the flower. Put your lid back on your paints and allow this to dry thoroughly. Now we're going to add in the sunflower petals. There aren't many, as our vase of flowers is wilting, so we need our petals to have impact. 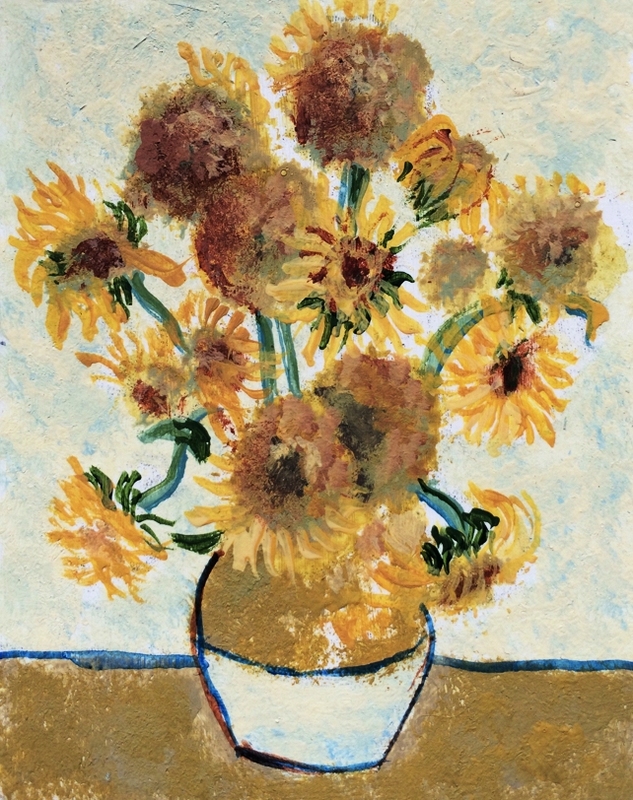 Mix yellow ochre, arylamide yellow light and white, and using the small round brush paint in the petals. You can also use a cocktail stick as a tiny painting knife. Some texture is good, the main thing here is to observe the different lengths and different directions of the petals. Look at the whole painting. Squinting at it is a good idea as this helps you to find where you need to be darker and where you need to be lighter in order to see each flower. Using tiny amounts of a burnt umber/yellow ochre mix, add in your darkest darks, and using arylamide yellow light/titanium white add in your lightest lights. Mix some French ultramarine blue with a little water and using your small round brush paint in the line on the left hand side of the table. Using the same brush without reloading with paint, add in the lines on the right hand side of the table. Notice that there are two lines, and they don't both go the whole way along. Reload your brush with a touch more French ultramarine blue and using broken lines, paint in the vase base line and the line around the front of the vase. The sides of the vase are painted with burnt umber mixed with water. Add the blue highlights on the vase. And now for the most important part, the signature. Mix French ultramarine with water until you have a single cream consistency, and practice writing "Vincent" on a scrap of paper. It's harder than it looks! When you're happy with your writing, add in the signature and leave your masterpiece to dry. After a couple of weeks' drying, your painting will be ready to varnish. Use a clear gloss acrylic varnish and a half inch wide flat brush, and apply the varnish in clean sweeps. Once dry, pop the painting into the frame and enjoy! You can see the original painting at the National Gallery in London, UK. If you can't make it to London you can view the painting at www.nationalgallery.org.uk/paintings/vincent-van-gogh-sunflowers. If you have a go, do post a picture in the comments below. And if you have any questions at all, ask away! Your miniature is absolutely fabulous, Stephanie! Thank you for sharing the process: the outline on acetate is a great idea for keeping the lines in mind!